Water at night. No - that doesn’t encourage disease - it rains at night. Use compost, volcanic rock sands, organic fertilizer, and molasses. Avoid synthetic fertilizers and toxic chemical pesticides. Elbon rye with and without organic inputs. Photos compliments of Dr. Mike Amaranthus. 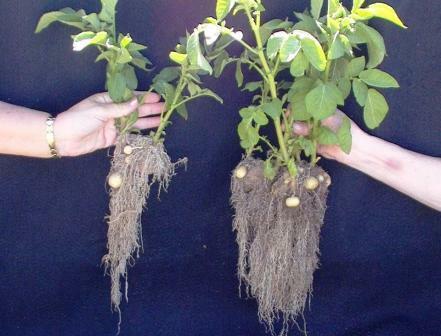 Potato in weak soil - Potato in biologically active soil. Here's how it works: Soil with 5% organic matter can hold almost 200 pounds of water in every 100 pounds of dry soil. 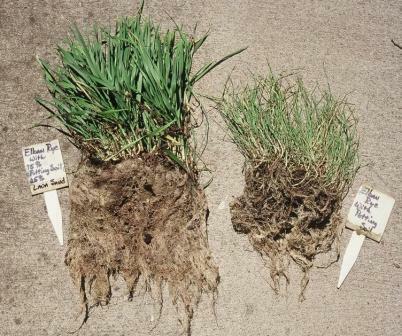 A similar soil with only 1% organic matter can hold only 30 pounds of water in the same soil. Therefore, for every 1% increase in organic matter, the same 100 lbs. of soil is able to absorb and hold 30 - 40 more lbs. of water. Check me on the numbers, math is not my strong suit. In addition, the roots of plants in healthy organic soil are dramatically larger and more efficient. Is it any wonder that golf courses, commercial and residential landscapes and public gardens can save money on water in an organic program? Organic Golf Courses: Texas Tech and Tierra Verde. Recent News Story: The Grass is Greener at Harvard.